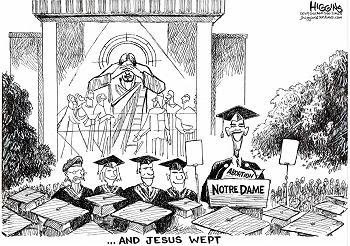 The University of Notre Dame in South Bend, IN, was treated to the rare privilege of a commencement address delivered by the President of the United States. It was also treated to the not-at-all rare experience of a commencement address consisting of tiresome pap about finding common ground among people of diametrically opposed world views, blah blah blah. It's hard to say what's more offensive: Obama's thoroughly inappropriate presence on the podium of a Catholic institution of higher education, the anticlimactic banality of his words, or the rank vulgarity of his opening "softening up" paragraphs as he once again displayed his total lack of taste and talent in the field of light comedy, especially as he tries to make light of things that are just not funny. It was a performance not so far removed from his recent lame-o appearance at the annual Washington correspondents' dinner, where he had the good fortune to be followed by the Wanda Sykes act which so surpassed him for crass mean-spiritedness that most people forgot how crappy the President's own "set" had been -- how many pained silences and occasional thuds and groans had greeted his attempts to make light of serious issues and problems, from the "Scare Force One" disaster over Manhattan, to death from Mexican flu, to the shameful persecution of Larry Summers at Harvard, to the terminal idiocy of his chosen Vice President. At Notre Dame Mr. Obama delivered in many respects exactly the kind of speech one would anticipate from such a person [and the world is full of them]: one who has absolutely no concept of what it means to have a deep-seated, irrevocable moral conviction grounded in the dictates of an eternal and unchanging God. This is why there is never any need for any Catholic institution to hand a microphone to this sort of speaker -- there are far too many accomplished and brilliant Catholic scholars and leaders (really, there are! 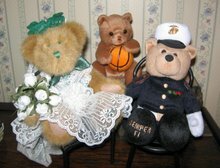 ), living examples of fidelity, for a school to waste its commencement address on someone who doesn't speak the same language the students do (or SHOULD DO, after four years in a Catholic college) on matters of the greatest importance to their lives, to the future of human existence, and to life in the world to come. It is hard even to be offended by Mr. Obama's self-serving analysis of the dangers and challenges that lie before this graduating class, made worse by the massive the burdens he himself has laid upon their futures in a mere 100 days of national deconstruction. Nor by the recitation of leftist talking points about climate change, diversity, greed, yada yada yada. Nor even by his obtuse referencing of "cultural divides" regarding stem cell research or AIDS, or the perverse bromide about how "faith necessitates doubt" [excuse me?]. And he can be forgiven for holding up the execrable Cardinal Bernardin as an example of moral leadership, since in this he is no different from far too many Catholics -- that scandal is on their heads rather than Obama's. Sadly, it is not so difficult to imagine how a "faith journey" that leads past Bernardin can wind up in the pews of Jeremiah Wright (though Obama carefully avoided mentioning that this was his resting place when he was "brought to Christ"). No, none of these irritations constitute the most offensive elements of President Obama's performance today under the Golden Dome of Our Lady. What offends most is that, having persevered in keeping an engagement that would be a source of controversy and division among adherents to a faith he does not share, he thought he could joke his way around the gravity of the situation, with a crass and clueless riff on the previous controversial address at a Catholic college [Xavier] which declined to award him an honorary degree. And that he could paper over the deep moral divide between his very clear record (furthering the deliberate termination of innocent but inconvenient life both before and after birth), and the doctrine of the Catholic Church on the sanctity of human life, by giving lip service to support for adoption, childcare, and contraception ("reducing unintended pregancies") -- as if this makes his record less of an outrage. What offends is the bald-faced lie that Mr. Obama actually desires "common ground" -- that he has any intention of "honoring the conscience" of those who disagree with the received leftist position on the "right to choose." With a straight face he spoke of the desirability of "vigorous debate", in hopes that "surely we can do so without reducing those with differing views to caricature." Then, about half a dozen paragraphs down, the students are warned that, "You will hear talking heads scream on cable..." Are these "Fair-minded words" or reduction to caricature, Mr. President? The greatest offense in this whole affair -- it goes without saying but let's keep saying it anyway -- has been the conduct of Fr. John Jenkins, president of Notre Dame (at least until tomorrow morning), which has gotten more petulant and abrasive with every development in the story. He topped it all off with his sycophantic Kumbayah introduction of the interloper at today's commencement. Too obtuse himself to recognize what a strategically advantageous move it was for Obama to, literally, don the mantle of Notre Dame for a day, Fr. Jenkins actually congratulated the President for accepting his invitation to speak, as if it required a thimbleful of courage. On the contrary -- having garnered more than half the Catholic vote last November, Obama's appearance increased the comfort level of Catholic voters with their choice, in case his immediate pro-abortion policy decisions might have made them a little dubious. Fr. Jenkins was especially memorable as he praised Obama for not being "someone who stops talking to those who disagree with him." This was specific to the issue of abortion -- as if Notre Dame should feel grateful that the Great One deigned to appear under these unsavoury circumstances. Let's re-cap, Father: This is the same Obama who, in his first meeting with Republican leaders in Washington, slammed the lid on discussions of compromise by trumpeting, "I WON", and told a fellow Democrat who couldn't support his stimulus plan that he was "KEEPING SCORE." [links here] It's not so much that Mr. Obama doesn't stop talking, it's that he wants those who disagree with him to stop talking, period -- just ask Hannity and Limbaugh. Ever since the advent of candidate John F. Kennedy in 1960, it's been a dark sort of entertainment to watch unworldly Catholic priests and religious weigh in on political matters, too often showing themselves to be at least babes in the woods -- the sad part of the last 10 or 15 years has been watching them willingly throw Catholic principles unde r the campaign bus in their continuing quest to look relevant and modern. At least l'affaire Notre Dame has also been an occasion for the greater public to see uncharacteristically faithful leadership from six dozen bishops, resistence from substantial numbers of students and (to a lesser degree) faculty, and 350,000 signatures on a petition to halt the travesty which proceeded this afternoon. This follows on some equally powerful counter-witness during the fall elections regarding apostate Catholic politicians who would try to remake the Church in their own image. Let us pray that this is a sign of a corner turned in American Church-state relations, with a fresh font of faith bubbling up from below among the John Paul II generation. 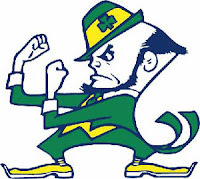 Cheer, cheer for New Notre Dame? Posted by Winefred at 11:19 p.m.